Jenny qualified from The Royal Veterinary College in 2008 and undertook her 1st job as an equine intern at a busy equine referral hospital in Yorkshire for 12 months. Since then Jenny has worked all over the country in mainly equine practice before moving to Penmellyn in May 2016 to join the 100% equine team. Jenny enjoys all things medicine and in 2013 achieved the RCVS accredited Certificate in Advance Veterinary Practice specialising in Equine Internal Medicine so gets the nifty initials, CertAVP(EM) after her name! 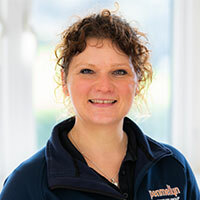 Jenny has particular interests in gastric ulceration and respiratory disorders but enjoys being able to work on a variety of medical problems from weight loss, liver disease, laminitis to name but a few. Outside of work Jenny pretends to be a hobby farmer looking after her small herd of rare breed sheep and a few Gloucester Old Spot pigs with her partner.